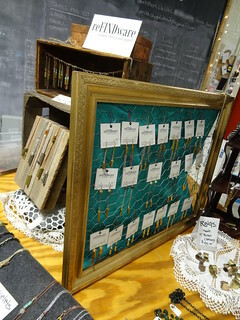 Shop Small, Buy Local, these are phrases we hear daily; with the explosion of entrepreneurship in Detroit, it is becoming easier to do just that. At one time an individual had to have drive, a college degree and a hefty bank loan to open an independent business. These days with hard work, determination, passion and help from non-profits like Ponyride, artisans and social entrepreneurs are given the opportunity to open a business with low start-up costs. 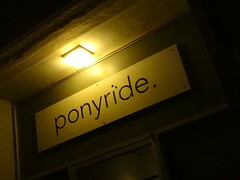 Ponyride purchased a 30,000 sq ft warehouse on Vermont for $100,000.00, space rents for approximately $0.25 per sq ft, which includes the cost of utilities. The low-cost of rent allows the tenants to concentrate on the creative side of their business without always having to worry about making their next rent payment. The mission is this: “Ponyride nurtures collaboration using shared resources, knowledge and ideas to cultivate opportunities created by the strength and crises of Detroit. 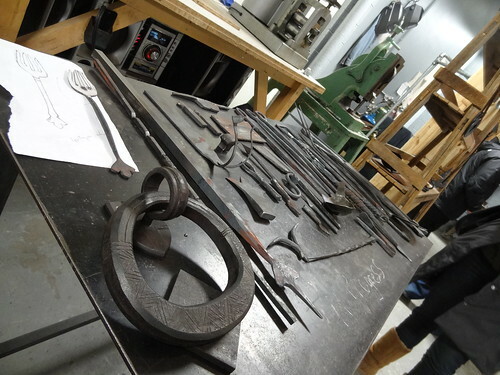 Participants serve Detroit communities by sharing their craft and expertise.” In other words, individuals work as a team; they assist one another, teach classes, volunteer their time–everybody wins! 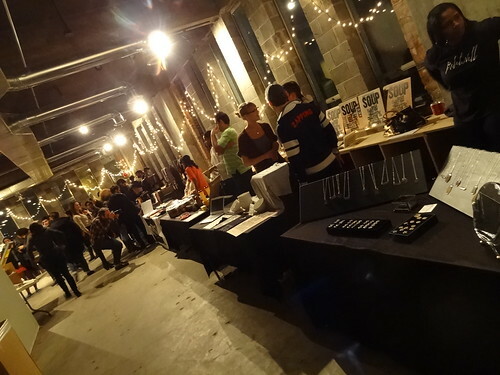 Tonight Ponyride is hosting an open-house and Makers Mart, in addition to seeing the renters spaces, pop-up businesses are also selling their wares. 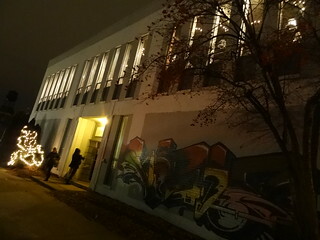 When we arrive the surrounding streets are lined with parked cars, lights blaze from the second story windows, we walk to the building joining up with others who are attending the event. Inside, the place is jumping! Strands of white lights criss-cross the ceiling, the crowd is packed shoulder to shoulder. 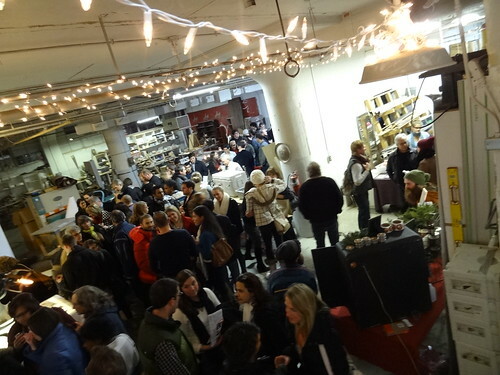 To the left the space opens up into one large room, individual vendors line the walls; we find artisans selling paintings, fiber arts, jewelry, clothing and Wolf Moon Mixers, fresh juice combinations to mix with your favorite spirits. Tonight they are selling bottles of Watermelon Mint, Hibiscus Margarita Mix and Citrus Mix, they look beautiful too! We meander the maze that is the first floor, Beard Balm has a large table stacked with tins of, well, Beard Balm, a leave-in conditioner for, you guessed it-beards. They distribute their products from the building. 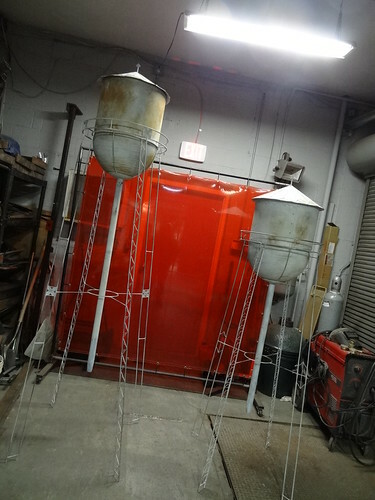 We enter a space with a vintage band saw and miniature water towers, hhmm….. I’d like one for my yard. Through a doorway we are greeted with the scent of fresh ground coffee from Anthology, the Smith Shop, a metalworking studio, has a huge display of pieces for sale; jewelry made from nails, housewares, hardware, belt buckles, all very cool. 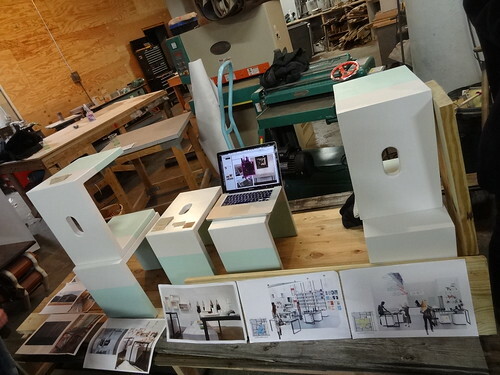 In addition they host classes, workshops and private lessons from their space. 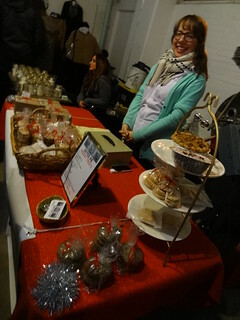 We see a familiar face at the Sister Pie table, Lisa makes delicious pastries, after tasting every one of her samples, we purchase a package of her Buckwheat Chocolate Chip Cookies–yum! Next we stumble upon a woodworking area, pieces of furniture are in multiple stages of completion, canning jars holding white pillar candles are set about, we recognize yet another face, this space belongs to Kaija–architect, entrepreneur, furniture maker, you name it, she is also a board member of Ponyride. 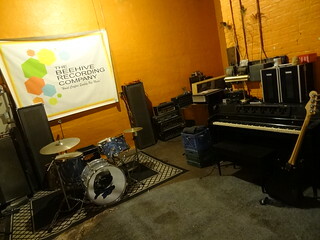 A short stairway leads us to the basement, home to Beehive Recording Company. Instruments, monitors and speakers fill the large room. Recording bands for free since 2010, they have captured over 68 different artists ranging from Jazz to punk, rock and roll to hip hop. 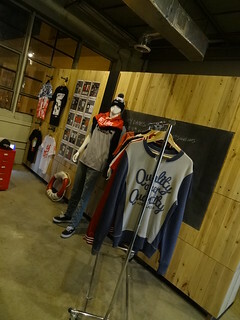 The second floor is equally as crowded, Dirt Label has several racks filled with t-shirts, sweatshirts and caps. Detroit Denim occupies a large portion of the second floor, they design, cut, sew, and finish all of their jeans in this shop using only US sourced materials. I love the vintage industrial sewing machines, they say some of them are over 100 years old! 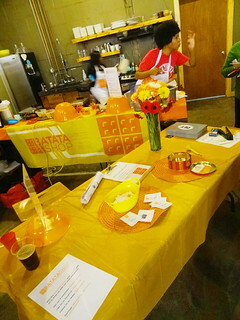 Our noses lead us over to the Batata Shop (Batata is Spanish for sweet potato), tables are covered in orange and yellow cloths, menus list tonight’s offering, waffles made from sweet potato and whole wheat flour. 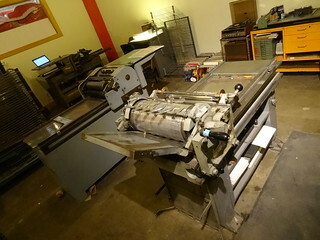 Stukenborg Press is both an art studio and an educational facility that teaches letterpress techniques; the letters are fascinating to look at. 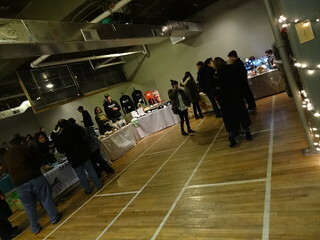 We traverse the second floor through hallways and sectioned off spaces, Cyberoptix is selling ties, we watch another group as they silkscreen shirts and bags, the Sushi looks amazing…. The thing we find most intriguing the entire night is an organization called The Empowerment Plan, you may have read about it. The non-profit organization hires homeless women from local shelters and trains them to be full-time seamstresses. They manufacture a coat that transforms into a sleeping bag, which is then given out to homeless people living on the streets at no cost to them. Made from left over scraps of sound absorbing material from the Chevy Malibu and Buick Verano, the coats are self heated and waterproof, how amazing is that? I encourage you to click here and read more about it. 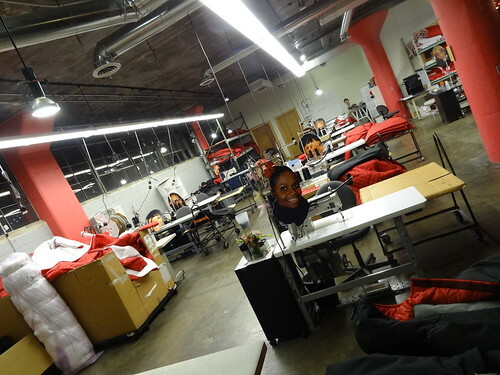 Veronika Scott created The Empowerment plan as a 20-year-old woman in 2011, the coats are made right here. 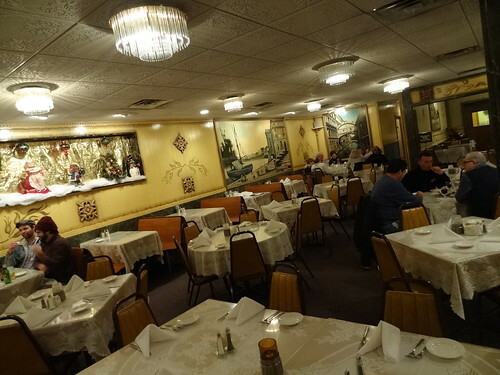 It is a short drive to Vince’s Italian Restaurant in Southwest Detroit. A neighborhood staple since 1960, Vince’s was founded by Vincenzo and Maria Perfili. Beginning as a 4-table pizza parlor, through the years it has grown into the restaurant you see today. The dining room is decked out for Christmas, glass covers the lace tablecloths, booths and chairs are upholstered in gold fabric, murals depict life in Italy. 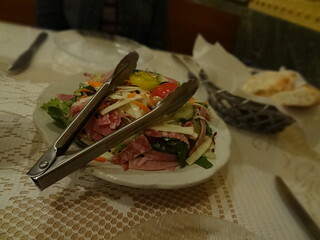 As we glance over the menu a basket of warm bread is placed on our table, it’s the kind of bread you can make a meal out of, crispy outside, warm and tender inside, we’re going to need another basket….The combination salad is delicious; ham, salami, cheese and olives sitting atop perfectly dresses greens. 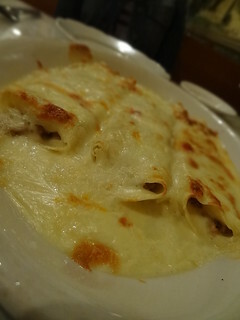 The cannelloni is drenched in a creamy white sauce, the cheese has been baked to a delicate brown, the meat filling, tasty. When we have finished, the plates are clean and there isn’t a crumb of bread to be found. It’s been another great night in Detroit. ← DETROIT: Boats, Bagels and Beans ? ?